In all likelihood, you made a five-figure investment when you purchased your vehicle. You continue to invest thousands more in it through routine maintenance. This emphasis on maintenance should extend far beyond regular oil changes and tire rotations, however. Keeping your car in its best shape means keeping it inside your garage as much as possible. Yes, your garage can serve as extra storage space, but this should never be the priority. As you begin to clean and organize your garage, remember your storage limitations. You need to maintain sufficient space for all vehicles. Your efforts will ensure that you actually use your garage for what it’s intended for, and therefore extend the life of your vehicle. While you’re sorting out all of the important items and junk in your garage, it helps to keep the car outside, so that you have more space for your organizational processes. Begin in one corner and work your way through the entire garage, sorting every item into one of three categories: keep, sell/donate, or toss. Look at expiration dates on chemicals, and if it’s time for them to go, pay attention to any special disposal processes they may list. Get rid of any broken items that you’re not sure you’ll be able to repair within the next month. Once you’ve thrown all undesirable items in the trash, further sort the sell/donate pile. This set of objects should include toys your kids have outgrown and personal equipment you’ve failed to use in the last two years. Options for donating and selling include Goodwill, Craigslist, and garage sales. Now your garage should exclusively contain items you want to keep. Does everything actually belong in the garage? Consider moving items not typically associated with the garage if you can think of a better place to put them, such as a shed or shelf in your house. For safety reasons, propane should never be stored in the garage. 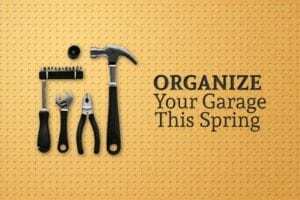 It’s tempting to buy the first organizational system for your garage that you spot, but this approach won’t work long term. First, you need to take note of your garage’s dimensions and the locations of switches, springs, doors, and windows. Create a floor plan detailing where you’ll keep your car and all other items. When possible, keep like items together. For example, all lawn care equipment should be stored in the same place. Otherwise, assign garage storage space based on how often you use the equipment. Only buy containers as you identify a need for them. When possible, take advantage of shelving and vertical space. Ideally, you’ll check your garage door’s functioning once every month. Begin by testing the door’s balance. Adjust the release mechanism on your garage door opener to allow you to operate the door by hand. Look for resistance when you manually lift the door. Once opened, wait to see if it starts to close. If it cannot stay open on its own, schedule a tune-up with your technician. To test the reversing feature, place a 2×4 inch block of wood flat on the floor. It should be located near the garage door’s center. Activate the transmitter to close the door. When it strikes the wood block, the door should reverse. If it fails to reverse, contact your local technician to schedule a consultation. Your faulty reversing system may warrant repair or a complete replacement. If the reverse feature appears to work, then test the garage door once more, this time without the wood block. Listen carefully: do you hear creaks or groans? These could be signs of trouble. If you’re anything like the average homeowner, your garage door opener doesn’t have a designated spot; rather, it sits wherever you place it when you return home from a long day at work. This is a recipe for disaster — not only do you risk losing it, but you may also place your young children at risk, as kids often mistake garage door transmitters or remotes for toys. Find a secure place to store this essential item, and commit to returning it to this spot every day. Remote transmitters are not the only mechanisms that pose hazards for young children. If your push wall control is located within easy reach, your kids will likely be tempted to press it. The switch should be placed five feet above the ground, and at a safe distance from any moving parts. Set aside at least one weekend a year for cleaning and organizing your garage — and checking it for safety issues. And if you’re not sure that your garage door is operating properly, contact Action Garage Door.